It explains the LIFE Posidonia project, the beneficial contribution of Posidonia fields, the threats fields face and a list of good practises recommended in order to avoid harming Posidonia. Published by : Consellería de Medi Ambient (Local Ministry of the Environment). It depicts the main characteristics of Posidonia and reviews the historical uses it has been given, and explains the main endangering threats the plant suffers at present. “El Tresor de Posidó”, “El Tesoro de Posidón”. 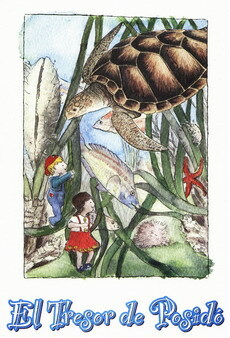 Comic book for children in which two boys accompanied by a turtle visit Posidonia fields at the bottom of the sea and observe the great variety of living beings that inhabit this ecosystem. Published by: Consellería de Medi Ambient (Local Ministry of the Environment).